Objectives To evaluate the efficacy and safety of different doses and regimens of filgotinib, an oral Janus kinase 1 inhibitor, as add-on treatment to methotrexate (MTX) in patients with active rheumatoid arthritis (RA) and inadequate response to MTX. Methods In this 24-week phase IIb study, patients with moderate-to-severe active RA receiving a stable dose of MTX were randomised (1:1:1:1:1:1:1) to receive placebo or 50, 100 or 200 mg filgotinib, administered once daily or twice daily. Primary end point was the percentage of patients achieving a week 12 American College of Rheumatology (ACR)20 response. Results Overall, 594 patients were randomised and treated. At week 12, significantly more patients receiving filgotinib 100 mg once daily or 200 mg daily (both regimens) achieved an ACR20 response versus placebo. For other key end points at week 12 (ACR50, ACR-N, Disease Activity Score based on 28 joints and C reactive protein value, Clinical Disease Activity Index, Simplified Disease Activity Index and Health Assessment Questionnaire-Disability Index), differences in favour of 100 or 200 mg filgotinib daily were seen versus placebo; responses were maintained or improved through to week 24. Rapid onset of action and dose-dependent responses were observed for most efficacy end points and were associated with an increased haemoglobin concentration. No significant differences between once-daily and twice-daily regimens were seen. Treatment-emergent adverse event rates were similar in placebo and filgotinib groups. Serious infections occurred in one and five patients in the placebo and filgotinib groups, respectively. No tuberculosis or opportunistic infections were reported. Conclusions Filgotinib as add-on to MTX improved the signs and symptoms of active RA over 24 weeks and was associated with a rapid onset of action. Filgotinib was generally well tolerated. Current rheumatoid arthritis (RA) guidelines advise treat-to-target strategies, with a focus on patient involvement in treatment decisions.1 ,2 With the emergence of novel and effective therapeutic agents for the treatment of RA, patients and physicians are able to consider factors alongside efficacy and safety, including the rapidity with which agents reduce pain and inflammation and the convenience of administration. Since conventional disease-modifying antirheumatic drugs (cDMARDs) are often slow acting, and biological DMARDs (bDMARDs) are limited to intravenous or subcutaneous use, and also have the potential for immunogenicity (responsible both for immune-related side effects and loss of efficacy),3 there remains a need for novel, rapidly acting agents that can be orally administered.4 ,5 In addition to improved convenience for patients, such agents may reduce the need for glucocorticoid-bridging therapy. The Janus kinase (JAK) receptor JAK1 is implicated in the RA disease process through its role in cytokine signalling. For example, the pro-inflammatory cytokine interleukin-6, which is known to play a major role in RA pathogenesis, acts through a JAK1/JAK2 heterodimer-mediated signalling cascade.6 ,7 By contrast, other signal transduction pathways can function independently of JAK1, such as erythropoietin signalling in erythrocyte precursors, which exclusively uses a JAK2 homodimer. JAK inhibitors are low-molecular-weight products that can be administered orally. The pan-JAK inhibitor tofacitinib has been approved by the US Food and Drug Administration for use in patients with moderately to severely active RA as a second-line agent after methotrexate (MTX), and other JAK inhibitors are in development.8 ,9 Filgotinib (GLPG0634/GS-6034) is a potent and selective inhibitor of JAK1,10–12 currently under investigation for the treatment of RA and inflammatory bowel disease. Pharmacokinetic–pharmacodynamic studies of filgotinib and its active metabolite indicate that both moieties contribute to pharmacodynamic effects, resulting in a relatively long duration of JAK1 inhibition,13 suggesting that filgotinib has the potential to be active not only in twice-daily dosing but also in a once-daily regimen. The efficacy and safety of filgotinib in patients with RA has previously been investigated in two 4-week phase IIa studies;14–16 results from these studies informed the design of this phase IIb dose-finding study. DARWIN 1 was designed to evaluate the efficacy and safety of different doses of filgotinib, administered as once-daily or twice-daily regimens, as add-on treatment to MTX, in patients with moderate-to-severe active RA and an inadequate response to MTX. This was a 24-week, multicentre, randomised, double-blind, placebo-controlled, phase IIb, dose-finding study of oral filgotinib, administered as add-on treatment to patients' stable dose of MTX (ClinicalTrials.gov identifier: NCT01888874). The study was conducted at 106 centres in 21 countries in four predefined geographical regions. Eligible patients were randomly assigned to treatment using a computerised IXRS system (S-Clinica, 6, Chaussée de Boondael, 1050 Brussels, Belgium) to receive placebo twice-daily or three daily dose levels of filgotinib—50, 100 or 200 mg—administered twice daily or once daily, in a 1:1:1:1:1:1:1 ratio, stratified by geographical region and previous use of bDMARDs. At each study visit, numbered kits containing study medication were dispensed via the IXRS system. Patients, investigators, study coordinators, the sponsor and study team were blinded to treatment assignment. At week 12, patients on placebo who had not achieved a 20% improvement in swollen joint count based on 66 joints (SJC66) and tender joint count based on 68 joints (TJC68) were reassigned to receive filgotinib 100 mg once daily or 50 mg twice daily; patients who had not achieved this target who were receiving filgotinib 50 mg once daily were reassigned to receive filgotinib 100 mg once daily, and patients on filgotinib 25 mg twice daily received filgotinib 50 mg twice daily, continuing on their new dose until week 24. Enrolled patients were ≥18 years of age with a diagnosis of RA for ≥6 months prior to screening, met the 2010 American College of Rheumatology (ACR)/European League Against Rheumatism (EULAR) criteria for RA and ACR functional class I–III, had ≥6/66 SJC and ≥8/68 TJC, a screening serum C reactive protein (CRP) ≥0.7×upper limit of laboratory normal range (ULN) (changed from ≥1.5×ULN in May 2014 to facilitate recruitment), had been receiving MTX for ≥6 months and on a stable dose (15–25 mg/week, oral or parenteral) 4 weeks prior to screening, and if receiving oral glucocorticoids (≤10 mg/day) or non-steroidal anti-inflammatory drugs were on a stable dose for ≥4 and ≥2 weeks, respectively, prior to baseline. Females of childbearing potential were required to be using a medically acceptable means of contraception. Details of laboratory-defined inclusion criteria are listed in the online supplementary materials. Patients were excluded if they were receiving current therapy with any DMARD other than MTX, or if they were receiving or had previous RA treatment with a bDMARD. The only exception to this was if a biological agent had been received in a single clinical study >6 months prior to enrolment and if the drug was effective. Patients were also excluded if they had ever used a JAK inhibitor, a cytotoxic agent other than MTX or had received intra-articular or parenteral glucocorticoids within four weeks of screening. Further details of the exclusion criteria, including a list of infections that precluded enrolment in the study, are listed in the online supplementary materials. Efficacy assessments were performed at screening (joint counts and Patient's Global Assessment of Disease Activity only), baseline and at weeks 1, 2, 4, 8, 12, 16, 20 and 24. The primary efficacy end point was the percentage of patients achieving an ACR20 response at week 12. Key secondary end points were the percentages of patients achieving ACR20, ACR50, ACR70 and ACR-N responses, Disease Activity Score based on 28 joints and CRP value (DAS28 (CRP), including remission and low-disease activity (LDA)/remission), EULAR response and ACR/EULAR remission, Clinical Disease Activity Index (CDAI) and Simplified Disease Activity Index (SDAI) at every visit from baseline to week 24. Health-related quality of life (HRQoL) was evaluated to week 24 using the Health Assessment Questionnaire-Disability Index (HAQ-DI). Safety variables included adverse events (AEs) throughout the study period; vital signs (at each visit); physical examinations (at screening, baseline, week 12 and week 24); and 12-lead ECG (at screening, week 12 and week 24). Haematology and clinical chemistry laboratory assessments were performed at each visit. The National Institute of Health Common Terminology Criteria for Adverse Events (CTCAE) V.3.0 was used to describe laboratory changes during the study. All randomised patients who received at least one dose of study drug were included in the intent-to-treat (ITT) and safety populations. Patients who discontinued the study prior to week 12 were treated as non-responders for the primary analysis, and those who switched treatments at week 12 were handled as discontinuations and data were imputed from week 12 onwards. Efficacy data were analysed using non-responder imputation (NRI) for the ITT population and confirmed using last observation carried forward (LOCF) and observed case imputations in the ITT population; NRI and LOCF imputations were used for efficacy data in the per-protocol population. The primary analysis was conducted using a logistic regression model including treatment, geographical region and previous use of bDMARDs as covariates. Continuous parameters were analysed using analysis of covariance. Time-to-first response (ACR20/50/70) was analysed using Kaplan-Meier survival techniques, with treatment groups compared with placebo using a Cox proportional hazard regression model. Treatment versus placebo comparisons were carried out for each dose group versus placebo using Hommel's closed-testing correction procedure to adjust for multiplicity. Differences between the once-daily and twice-daily regimens were analysed exploratively. A sample size of n=85 per study group (N=595) was estimated to provide 90% power to detect minimum 28–30% treatment difference versus placebo, assuming a 20–40% placebo ACR20 response at week 12. The study was initiated in July 2013 and completed in May 2015. Of the 1255 patients screened, 599 were randomised and 594 received at least one dose of study drug and were included in the ITT and safety populations. At week 12, 66 non-responders were re-randomised to 100 mg daily dose of filgotinib (figure 1). The overall treatment discontinuation rate was low (n=61, 10.3%), and there was no significant difference in the number of patients who discontinued between the filgotinib and placebo groups. In addition, dropout rates did not increase with increasing doses of filgotinib or over time (weeks 0–12 vs weeks 12–24). Baseline patient demographics and disease characteristics were well balanced (table 1), apart from a trend towards (non-significant, p=0.0555) lower mean CRP in the placebo group. Patient disposition. Patients were randomised across 106 sites in 21 countries (Argentina, Australia, Belgium, Bulgaria, Chile, Columbia, Czech Republic, France, Germany, Guatemala, Hungary, Israel, Latvia, Mexico, Moldova, New Zealand, Poland, Russian Federation, Spain, Ukraine and the USA). b.i.d., twice daily; q.d., once daily. The primary end point of the study was met: at week 12, statistically significantly more patients achieved an ACR20 response compared with placebo (44% (38/86)) in the filgotinib 100 mg once-daily (64% (54/85), p=0.0435), 200 mg once-daily (69% (59/86), p=0.0068) and 100 mg twice-daily (79% (66/84), p<0.0001) dose groups (figure 2A). Raw ACR20 data for each time point are presented in online supplementary table S1. Efficacy end points: the percentage of patients achieving an improvement in American College of Rheumatology (ACR) of (A) 20% (ACR20), (B) 50% (ACR50) or (C) 70% (ACR70) over time though 24 weeks; (D) mean change from baseline in Clinical Disease Activity Index (CDAI) over time; (E) mean change from baseline in Disease Activity Score based on 28 joints and C reactive protein value (DAS28) (CRP) over time; (F) mean change from baseline in Health Assessment Questionnaire-Disability Index (HAQ-DI) over time. The vertical line at 12 weeks in (A) indicates the primary efficacy time point (non-responder imputation (NRI) (intent-to-treat population)). Patients who switched at week 12 were handled as if they discontinued at week 12 and were imputed using NRI (A–C) or last observation carried forward (D and E). *p<0.05; **p<0.01; ***p<0.001. b.i.d., twice daily; N, number of subjects per group; q.d., once daily. A dose–response was observed for all three ACR parameters (ACR20, ACR50 and ACR70; figure 2), and no statistically significant difference was found between the filgotinib once-daily and twice-daily regimens. An early onset of response was observed for ACR20 (from week 2 in the filgotinib 200 mg once-daily and 100 mg twice-daily dose groups (figure 2A)) and ACR50 (from week 2 in the filgotinib 100 mg once-daily and 100 mg twice-daily dose groups (figure 2B)). At week 24, the percentage of patients meeting ACR20 response criteria was also significantly higher compared with placebo in the 100 mg once-daily, 200 mg once-daily, 50 mg twice-daily and 100 mg twice-daily dose groups (A). An increase in the ACR20 response over time was observed that appeared to plateau at week 8 in the majority of filgotinib treatment groups and was maintained up to week 24. The percentage of ACR50 responders was statistically significantly higher compared with placebo across all filgotinib dose groups and regimens at weeks 12; this response was maintained or improved to week 24 (figure 2B) and 100 mg twice-daily dose groups compared with placebo at week 12; this response was improved or maintained at week 24, such that a significant response was observed across all filgotinib dose groups and regimens at week 24 (figure 2C). Statistically significant improvements compared with placebo were observed after 1 week of treatment in the filgotinib 200 mg daily dose group for some components of the ACR index (TJC and serum CRP) (data not shown). ACR20/50/70 responses improved up to week 24 in non-responders who switched to 100 mg daily filgotinib at week 12 (see online supplementary table S2). At both weeks 12 and 24, disease activity (CDAI) had decreased to a significant extent versus placebo in all dose groups, with the exception of the lowest dose of filgotinib at week 12. An effect was observed early, with significant reductions versus placebo noted by week 2 in the 100 mg once-daily and 100 mg twice-daily dose groups (figure 2D). Similarly, at both weeks 12 and 24, the mean decrease in DAS28 (CRP) was statistically significantly greater across all filgotinib dose groups and regimens compared with placebo (figure 2E). An early onset of effect was observed in DAS28 (CRP) (from week 1 in the 100 mg once-daily, 200 mg once-daily and 100 mg twice-daily dose groups) (figure 2E). Both indices of disease activity showed a dose–response relationship and no statistical differences were noted between the once-daily and twice-daily regimens. For HAQ-DI, significant improvements versus placebo were noted as early as week 2 for filgotinib 200 mg daily. By week 12, these improvements were also noted in the 100 mg once-daily group, and by week 24, significant improvements compared with placebo were observed across all filgotinib groups (figure 2F). Raw data for each of the secondary efficacy end points illustrated in figure 2 are presented in online supplementary table S1. As detailed in table 2, a dose–response relationship was observed for all other efficacy variables. There were too few patients in each dose group who had previously received and responded to a biological agent to make valid comparisons of the efficacy of filgotinib in this patient population versus patients who were naive to biological treatments. Treatment-emergent adverse events (TEAEs) were reported at similar frequencies across all dose groups and treatment regimens (table 3). Fifteen patients had ≥1 serious TEAE (table 3), and of these, one patient (in the filgotinib 100 mg twice-daily group) died due to pneumonia and septic shock; this was the only death in the study and was considered by the investigator as possibly treatment related. Two patients had serious cardiovascular events: one patient (with a history of myocardial infarction and cardiac failure) experienced unstable angina and subsequent myocardial infarction and one patient experienced an ischaemic cerebral infarction; these events were not considered to be treatment related. Serious TE infections were reported in one patient receiving placebo and five patients receiving filgotinib (see table 3 for details). TEAEs considered related to study treatment occurred more frequently in the filgotinib groups (20.9%) compared with placebo (10.7%). Few patients in any group discontinued due to TEAE (table 3); infections led to discontinuation in one patient receiving placebo and five patients receiving filgotinib. Herpes zoster infections were observed in five patients, one receiving placebo and four receiving filgotinib; all of these cases resolved without complications. No cases of tuberculosis (TB), opportunistic infections, lymphoma or cancer were reported throughout the study. Data for haematology parameters are presented in online supplementary table S3. Up to week 12, dose-dependent increases were observed in mean haemoglobin concentrations in all filgotinib groups, but appeared to plateau thereafter (figure 3A). Overall, no decreases in mean absolute lymphocyte counts were observed, although there were individual fluctuations. Dose-dependent decreases in neutrophil counts were seen in all filgotinib groups (figure 3B). These stabilised at week 4, with the exception of the filgotinib 100 mg twice-daily group, in which a further decrease was seen from weeks 16 to 24. Non-responders who switched to filgotinib 100 mg also experienced a reduction in mean neutrophil count from week 12 (data not shown). Dose-dependent decreases in mean absolute platelet count were observed in the filgotinib treatment groups up to week 4, following which counts appeared to plateau, with some fluctuations (figure 3C). There were no dose-dependent changes in mean natural killer (NK) cell counts over time. The number of CTCAE grade 3 or 4 laboratory abnormalities was low, and in most cases did not lead to study discontinuation (table 3). Mean (SE) change from baseline over time in patients considered to be responders (achieved a 20% improvement in swollen joint count based on 66 joints and tender joint count based on 68 joints) and who continued on the same treatment throughout the study for (A) haemoglobin (g/dL), (B) neutrophils (×109/L) and (C) platelets (×109/L). b.i.d., twice daily; N, number of subjects per group; q.d., once daily. Up to week 4, dose-dependent increases in mean creatinine concentrations in filgotinib groups were observed, which plateaued in most treatment groups thereafter (data not shown). A mean increase of 6.1 µmol/L (11.5%) from baseline value of 58.9 µmol/L was observed in the filgotinib 100 mg twice-daily group. No CTCAE grade 3 or grade 4 abnormally high alanine transaminase (ALT) values were observed. One patient in the filgotinib 100 mg once-daily group had a CTCAE grade 3 aspartate transaminase (AST) value (table 3), not considered to be related to study medication; this subject had AST grade 2 abnormality at baseline and discontinued the study. Up to week 4, dose-dependent increases in both high-density lipoprotein (HDL) and low-density lipoprotein (LDL) cholesterol were observed in all filgotinib groups, which stabilised thereafter. The LDL:HDL ratio decreased over this period, indicating a greater proportional increase in HDL versus LDL. In this study, clinical efficacy in patients treated with filgotinib added to a stable dose of background MTX was evident in a dose-dependent manner, with an early onset of action. By week 12, statistically significantly higher proportions of patients who received 100 mg once daily, or 200 mg daily, regardless of the dose regimen used, achieved ACR20 response, compared with placebo. This response was maintained at week 24. Baseline imbalances in CRP level between the active treatment groups and placebo were explored in a logistic regression model: the discrepancy in baseline levels of inflammation did not influence the primary end point. At week 12, dose-dependent, statistically significant beneficial effects were also seen across the majority of secondary end points, which were maintained or exceeded at week 24, as illustrated by improving responses between weeks 12 and 24 in two major relevant outcomes, ACR70 and DAS28 (CRP) remission.17 ,18 The remission rates observed for CDAI also support a clinical benefit of filgotinib that is independent of CRP levels. A fast onset of effect was observed for ACR20/50/70 and DAS28 (CRP) responses, along with improvements in HRQoL (HAQ-DI); in addition to the convenience of oral administration, rapid action may facilitate effective treat-to-target strategies without the need for bridging glucocorticoids. 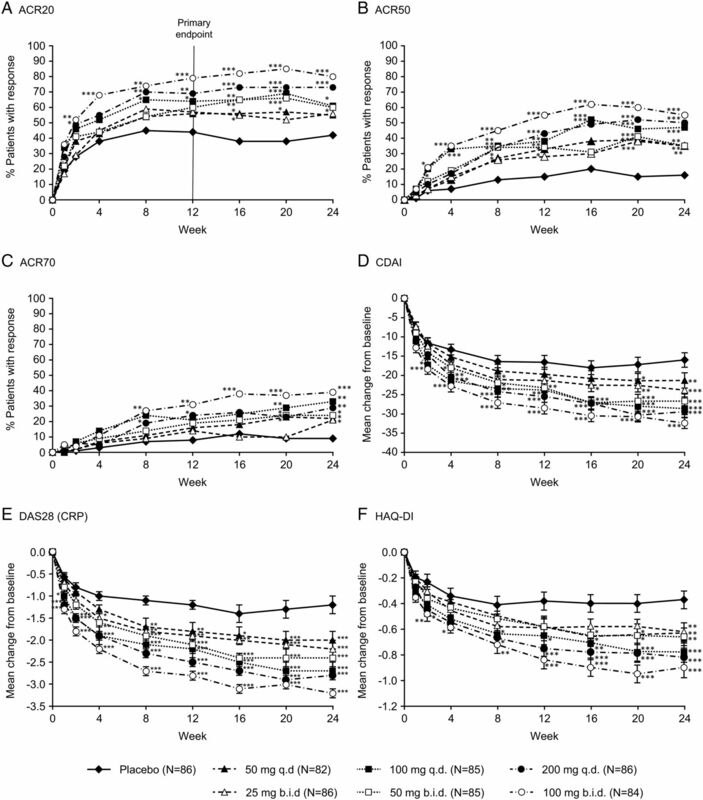 The filgotinib doses studied and the similar efficacy noted between the once-daily and twice-daily dosing regimens are in line with the previously reported pharmacokinetic and pharmacodynamic effects of filgotinib and its major metabolite, both of which selectively inhibit JAK1.13 Although there was a numerical trend towards better efficacy results with the 200 mg dose given as 100 mg twice daily versus 200 mg once daily, this trend did not extend to the next (lower) dose level of 100 mg, where the reverse trend was observed, such that the once-daily schedule generally performed better than the split dose. In terms of safety, there were no major differences in terms of AEs between the once-daily and twice-daily regimens. The chief limitation of the study was its short (24 weeks) duration, hampering definite judgement of longer maintenance of efficacy and eventual side effects. Furthermore, radiographic assessments were not included in the study design, so the impact of filgotinib on the structure of bones and joints could not be evaluated. In conclusion, the results of this phase IIb study of filgotinib, added to a stable background dose of MTX, demonstrate clinically relevant dose-dependent improvements in the signs and symptoms of active RA. At a daily dose of 200 mg filgotinib, these improvements were initiated rapidly and were sustained throughout 24 weeks of treatment, regardless of whether a once-daily or twice-daily dosing regimen was used. These robust data support the future development of filgotinib for the treatment of active RA in patients receiving MTX treatment.
. Xeljanz® (tofacitinib) prescribing information. Last revised Nov 2012.
. Clinical confirmation that the selective JAK1 inhibitor filgotinib (GLPG0634) has a low liability for drug-drug interactions. Drug Metab Lett 2016;10:38–48.
. Absence of effects of filgotinib on erythrocytes, CD8+ and NK Cells in rheumatoid arthritis patients brings further evidence for the JAK1 selectivity of filgotinib. ACR, 2015:2781.
. Treatment of rheumatoid arthritis patients with the JAK1-selective inhibitor GLPG0634 reverses an arthritis-specific Blood Gene Signature to healthy state. ACR, 2014:1494.
. The JAK1-selective inhibitor GLPG0634 is safe and rapidly reduces disease activity in patients with moderate to severe rheumatoid arthritis; results of a 4-week dose ranging study. ACR, 2013:2381.
. Efficacy and safety of GLPG0634, a selective JAK1 inhibitor, after short-term treatment of rheumatoid arthritis; results of a phase IIA trial. EULAR, 2012:OP0263. Acknowledgement The authors thank the members of the DARWIN 1 study group, the contract research organisation and all patients who participated in the trial. Contributors RW, PCT, AVdA, FV, CT and PH contributed to the conception, collation and analysis of the data. All authors contributed to the writing of the paper and participated in the review and interpretation of the data. All authors read and approved the final manuscript. Funding The work presented here, including the conduct of the study, data analysis and interpretation, was supported by Galapagos NV. Editorial assistance in the preparation of the manuscript was provided by Fishawack Communications, which was funded by Galapagos NV. Competing interests RW received unrestricted research grant from Roche to his institution, was advisor for Jansen (Golimumab) and part of the speaker's bureau of BMS. PCT has served as a consultant to Lilly, Galapagos and Pfizer. RA received grant support from Galapagos NV. MG has participated in clinical research studies for AbbVie, Amgen, Astellas, Celgene, Eli Lilly, Galapagos, Merck, Pfizer and UCB. FE-S, DP and MM were DARWIN 1 study investigators, funded by Galapagos NV. AVdA, FV, CT and PH are employees of Galapagos NV. Ethics approval The study was conducted in accordance with the ethical principles of the Declaration of Helsinki, Good Clinical Practice, International Council for Harmonisation guidelines, and all applicable national and local laws and regulatory requirements.